Tsarizm attempts to present opinions on matters of the region from all sides. This article is meant to spur conversation about the Baltic’s military exposure and its history. The independent kingdoms of Israel and Judea could only be independent when the little strip of land between the Jordan River and the Eastern Mediterranean that we now know as the Holy Land was, in geopolitical terms, a demilitarized zone of demarcation between the great empires of the day. From the tenth to the fifth centuries BC, it was the northern empires of Babylon and Assyria that were staring down Egypt, now perilously close to the end of its glory days, across Galilean hilltops and Judean desert canyons. To this day, it was this long standoff between these twin pillars of the ancient Fertile Crescent that allowed Israel its longest period of independence and hence the creation of its own and much of the modern world’s cultural heritage. That independence was not complete, of course. Both Judah and Israel were in the Egyptian sphere of influence. The Egyptians, mired in their own religious and civil strife, abandoned the Northern Kingdom of Israel with its Ten Tribes to be defeated by Babylon in 720 BC, its elites exiled never to be heard from again. Little desert Kingdom of Judah remained a loyal Egyptian vassal, never heeding prophet Jeramiah’s words on Egypt’s diminished status as a “cane made from broken reeds”. This reluctance to switch loyalties in a timely manner cost Judea dearly; in 582 BC, with Egypt in steep decline and the latest Babylonian Empire unchallenged, Judah too suffered the fate of destruction and exile. Even though Judean elites were allowed to return and reestablish a limited autonomy under the auspices of the new Persian Empire only 70 years later, true independence did not reemerge until the Hasmonean revolt against the waning Seleucid Empire, a Macedonian Hellenistic super-state that inherited most of the territories of the ancient Babylonian and Persian empires. In this brief interregnum lasting a mere two centuries between the collapsing Hellenistic and the ascendant Roman worlds, the Jews enjoyed a modicum of independence and built, together with the Second Temple, the foundations of both Rabbinical Judaism and Christianity. A dominant Imperial Rome, coming fully into its own in the first century AD could not allow the Jews even the appearance of internal independence, fearing that other provinces would require the same privileges. Two revolts later, Judea was renamed Palestina, the Second Temple and all of Jerusalem lay in ruins and the Judeans themselves were draining out of their ancestral homeland not to reappear on its doorstep for close to two millennia later, when another power vacuum, this time created by the Dying Man of Europe, the Ottoman Empire allowed them to finally do so. The modern State of Israel in every way continues the story of Jewish independence as a function of power vacuum and superpower standoffs. The first half of the 20th century was marked by the collapse of the Ottoman Empire soon followed by the collapse of its exhausted conqueror, the British Empire and the ascendance of the US as the leading world superpower. This power vacuum, even with the indescribable calamity of the Holocaust, allowed Jews to reestablish their hold on the Land of Israel, bringing back both its ancient people and its ancient name. After WWII, newly formed some would say almost stillborn Israel had to carefully pick its way between the Babylon and Egypt of the modern world; the Soviet Union and the USA. While linguistically (most of them were fluent in Russian) and politically (most of them were socialist), the leaders of young Israel were more closely aligned with Russia, their pragmatic approach, perhaps more finely tuned than that of King Hezekiah of Judah, pointed them in the direction of the US as a more dependable ally. In the end, the choice was made for them. Post Israeli success in the 1967 Six Day War, the USSR aligned itself unequivocally with the Arab nations, severing all diplomatic ties with Jerusalem and leaving Israel ripe to be plucked by the US as its only ally in the Middle East. As in antiquity, Israel is a reluctant vassal, relying more on itself for protection than its overseas sponsors. In all its wars, Israel has never asked the US to fight for it, nor has it any treaties that mandate that the US should do so. When promises to that effect were made by American presidents to try and extract territorial concessions, Israeli leaders, well-aware of the Western treachery towards Poland and Czechoslovakia in the run-up to WWII, steadfastly refused. Today, Israel is a friendly vassal of a benign overlord, the United States of America. But with smart, pragmatic leadership, it is also a country of nine million productive and innovative people with one of the strongest militaries in the region and a full, though undeclared, member of the world’s nuclear club. It would not be an exaggeration to say that Israel is now as independent as it has ever been in its 3,000 year history. But what about other small nations? Don’t they suffer the same fate of intermittent independence wholly reliant on the weakness of the larger powers on their borders? Today, the presidents of three such nations, Latvia, Lithuania, and Estonia visited President Trump at the White House to commemorate their “independence centennial”. Why centennial, one may ask. Are these newly formed nations? Of course not. Estonian language, part of the rare and exotic Finno-Hungaric family of languages, has been attested to in writing as early as the 13th century. So what happened in all that time? 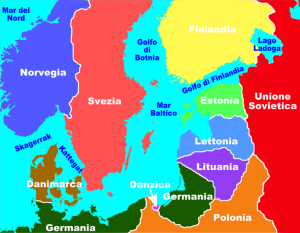 The answer is simple: the powers that be in the Baltic Basin, be it Prussia, Sweden, Poland, or Russia never allowed the small Baltic nations any measure of independence because it was contrary to their interests. Only in 1918, with the final defeat of Germany in WWI and with Russia in the throes of its revolution and civil war, with the rest of Europe burying its millions of dead and the US retreating into entre les guerres isolationism, could the trifecta of Baltic wunderkinds assert their independence. Estonian president Kersti Kaljulaid said today from her podium at the White House that for 50 out of the 100 years since independence, her country was occupied by the Soviet Union. That was, shall we say, a rather not insignificant fib. It is true that Estonia and the other two Baltic States lost their independence between 1940 and 1990, but for four of those fifty years they were occupied by Nazi Germany and not by the USSR, and even in the first year of their lost independence, it was lost to Stalin and the USSR under the auspices of the infamous Molotov – Ribbentrop agreement, a hellish deal in which both Stalin and Hitler were complicit. Perhaps Ms. Kaljulaid made this omission in good faith, but it would be a stretch for an informed observant to believe that. Rather, she was trying to gloss over the inconvenient truth that the Baltic States WELCOMED the Nazi armies washing over them on their way to the Soviet border in 1941, seeing in them a bulwark against Stalin’s evil machinations to disrupt their newly found sovereignty as he had done two years earlier when he agreed to the infamous Molotov – Ribbentrop accords. In other words, the Baltic Trio preferred Nazism to communism, German overlords to Russian ones. 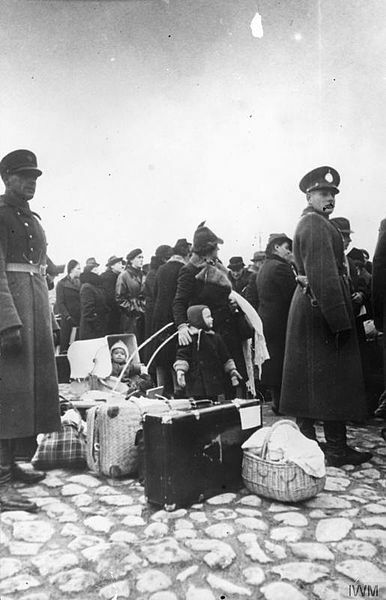 As the Nazis’ faithful and eager vassals, the Balts joyfully engaged in the ethnic cleansing of their countries from their abundant and successful Jewish communities. 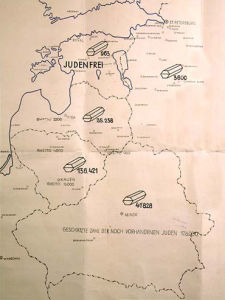 Jews have lived in the Baltics for nearly a full millennium, mostly left to their devices by the weak central power in those remote borderlands. Some of the leading world centers of Jewish learning were established in the Baltic cities and flourished there for centuries. All of that was lost at the hands of the grandparents of the nice little Baltic presidents paying homage today to their feudal overlord at the White House. Torah scrolls, many centuries old, were burned in city squares, synagogues were pillaged, private property, belonging to Jewish families for centuries confiscated. The Balts gleefully gathered their Jewish neighbors for one way trips to Treblinka, Bergen-Belzen, and Auschwitz, were many of them willingly served as guards and executioners. 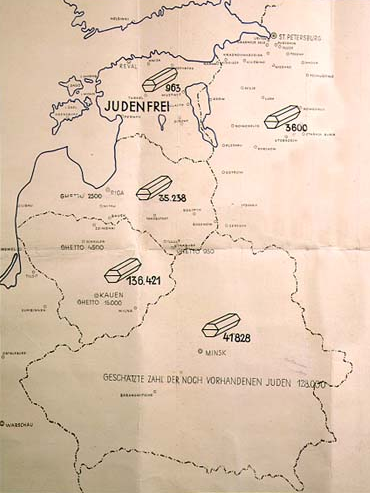 In addition to being the Germans’ willing little helpers with respect to the Final Solution of the Jewish Question, the Balts also eagerly participated in the surprise attack by Hitler’s Germany on the USSR in June of 1941, only a year after their own occupation by the Nazi forces. 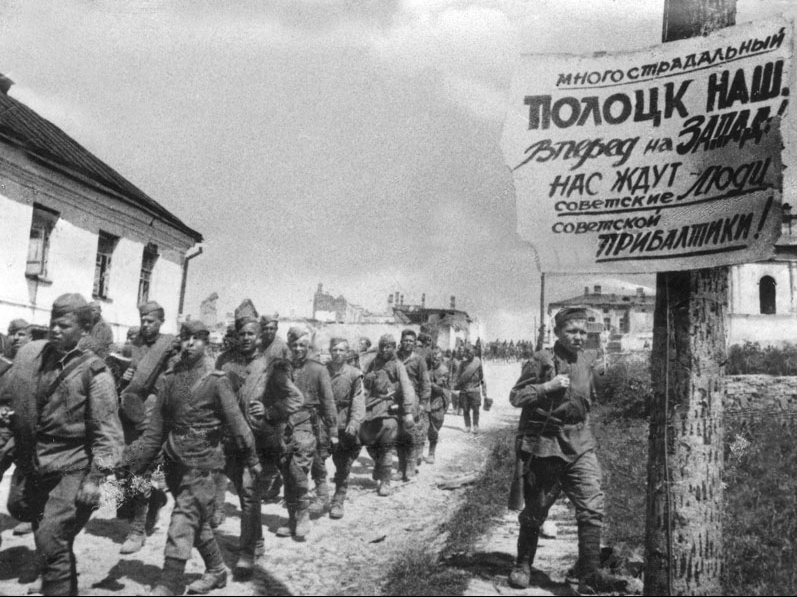 This constituted an attack by all three Baltics States on the Soviet Union, making their occupation at the war’s end by Stalin’s Red Army a legitimate act of retaliation. No amount of Euro-whining by the Balts can hide the fact that they, like Judah 2500 years earlier, simply bet on the wrong horse. They did it because they (even though they were for two centuries a part of the Russian Empire) were more comfortable with the West than with the East, more comfortable with German language than with Russian, with Protestant rather than Orthodox Christianity, with capitalism rather than communism. The USSR, and this may sound strange to many, treated its Baltic “republics” well. It made, within its limited abilities, major investments in rebuilding their postwar infrastructure, and I well remember as a child in the USSR in the late 1960’s how everyone knew that Latvia, Lithuania, and Estonia enjoyed by far and away the highest standard of living in the USSR, almost as high as their neighbor East Germany and higher than their other neighbor Poland. Today, the Balts are once again caught in the midst of superpower rivalry. Once again, their natural affinity lies in the West and they emphatically cast their lot with the EU and with NATO and dutifully pay obeisance to Brussels and to Washington. While Putin’s Russia is but a shadow of its former self, no longer a superpower in anything but its doomsday arsenal, it is early to say that the cute little Balts have made the right choice. After all, they are caught in a narrow strip of land between Saint Petersburgh and the Russian enclave of Kaliningrad, bursting as it is with nuclear-tipped Iskander missiles. Putin is weak, yes, but his back is to the wall and he, unlike the US or the EU does not have much to lose. The Russians unlike the West Europeans of the Americans, are not a whiny bunch of self-indulgent suburb dwellers, folks to whom life is defined by weekend trips to Walmart, or Amazon shopping sprees, or time shares on the Costa del Sol. Russians are tough and long-suffering and value national honor above frequent airmile points. Will the US and NATO intervene on behalf of the Baltic States should Putin take them citing their mistreatment of their sizable Russian minorities? The answer, if recent history is any guide, is an emphatic no. In the aftermath of the First World War, in the Treaty of Versailles, England and France gave ironclad guarantees to the newly formed Czechoslovakia and reconstituted Poland that any aggression by Germany would be met by their combined forces. “Any attack on you is an attack on us”, they said. But when Hitler attacked Czechoslovakia citing Germany’s cultural affinity to the ethnically German population of the Czech Sudetenland, England’s PM Chamberlain famously said that the people of Britain do not want to go to war in a place they never heard of for the sake of people of whom they know nothing. Emboldened, Hitler took Poland in two weeks. Oh, but how about a more recent example, one that directly involves the US? In 1990, with the breakup of the USSR into its constituent parts, the question arose what to do with the massive nuclear arsenal stationed in newly independent Ukraine. “Send it back to Russia and we will guarantee your territorial integrity” promised Bush the Father. Yes, in writing. Then 30 years later Russia put that “guarantee” to the test. They took the ethnically Russian and highly strategic Crimean peninsula away from the Ukraine and annexed it to Russia. Obama? NATO? A bit of whining, some meaningless economic sanctions. Crimea is now Russian. Period. Latvia has 25% ethnically Russian population. These people are in fact being somewhat oppressed as the Russian language is prohibited from official use and the anti-Russian sentiment is strong. What will happen if Putin annexes Latvia on the pretext that he is responsible for the wellbeing of all Russians? Will NATO declare war, risking a nuclear exchange? Of course not. Pearl clutching will ensue as usual, but nothing more. Crimea was Putin’s Czechoslovakia; Latvia will be his Poland. All three of the Baltic States have a combined population of roughly six million. They are tiny and strategically indefensible. Unlike Israel, they do not have a rich and influential diaspora and their adversary is not Egypt or Syria, but Russia. Among the three choices available to them in the post-Soviet world: continued alliance with Russia, strategic neutrality, and full alliance with the West against Russia, they chose Number Three. History will soon prove they chose wrong. Again.